A new honey beer ice cream has been whipped up for summer by Lanarkshire-based brewery Beehive Brae and Equi’s in Hamilton to celebrate Beehive Brae’s Blonde Honey Beer being stocked in Aldi stores across Scotland. Aldi tasked the team at Equi’s to create a new ice cream flavour using Beehive Brae’s Blonde Honey Beer to celebrate the local brewery making it onto Aldi shelves for the retailer’s Summer Beer Festival. 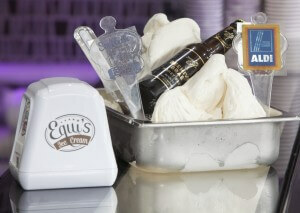 The limited edition Blonde Honey Beer ice cream will be on sale at Equi’s in Hamilton in June and July. Beehive Brae Blonde Honey Beer is on sale at all 67 Aldi stores in Scotland while stocks last (£1.79/330ml) after being hand-picked by the retailer’s ale experts for the in-store Summer Beer Festival. “Since 2012, we’ve held in-store Scottish Beer Festivals twice a year. This year, for the first time, we’re holding three Festivals in our stores across Scotland to reflect the incredible range of Scottish craft beer on offer as well as the growing demand from Scottish shoppers. It is very important to us at Aldi to give small breweries their first big break, allowing them a platform to showcase their fantastic craft beer. This summer, three out of four beers featured in the Festival have never been sold before at Aldi and we’re looking forward to giving our customers a taste of some delicious new drinks.